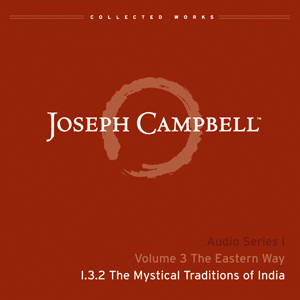 Joseph Campbell was fascinated by the various forms of yoga, traditional Indian spiritual practices that use meditation, physical exercises, and special breathing techniques to turn an individual’s focus to an inward path. In this talk, he surveys several yogic traditions the rigorous Kuṇḍalinī Yoga; Jñāna, or “philosophical,” Yoga; and Karma Yoga, the yoga of action. While extreme psycho-physiological exercises such as those of Kuṇḍalinī Yoga might not be appropriate for everyone, he argues, each of us can shape our destiny through the practice of one or another form of yoga.